The 39-year-old bridge disappeared from sight in seconds. It was demolished to make way for a new bridge. 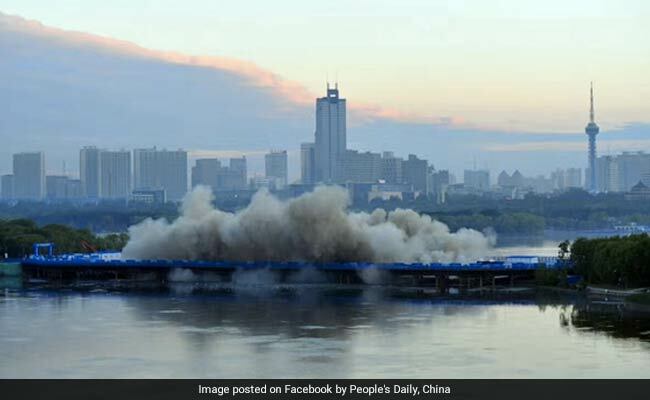 It took over 700 kilograms of explosives and just under 4 seconds to demolish the Nanhu bridge in northeast China on early on Sunday morning. Dramatic footage of the demolition was posted by several local news outlets on social media and it makes for an incredible watch. According to CGTN, the bridge was demolished to make way for a newer bridge. Built in 1978, Nanhu bridge was seen as a potential safety hazard. Engineers packed the bridge, nearly 150 metres long and 25 meters wide, with 710 kilograms of explosives. The bridge was demolished in an incredible 3.5 seconds, sending plumes of dust and debris into the sky. CGTN reports the debris will take between three to five days to clear up. According to ChinaDaily, the new bridge will be wider, allowing for space on both sides of the bridge to be reserved for pedestrians. The new bridge is expected to be open to traffic by the end of September.